I have recently started Toddler friendly recipe page and have mentioned about the guest post from Moms. Today we have a guest, My very good friend Srividhya from Vidhya’s Vegetarian Kitchen. Ever since we knew each other I have a good rapport with her. More than blogging, I remember having lot of general and personal chat with her. Usually if I have any doubts about the food I give for my toddler or any general toddler related questions she is one among few with whom I discuss. 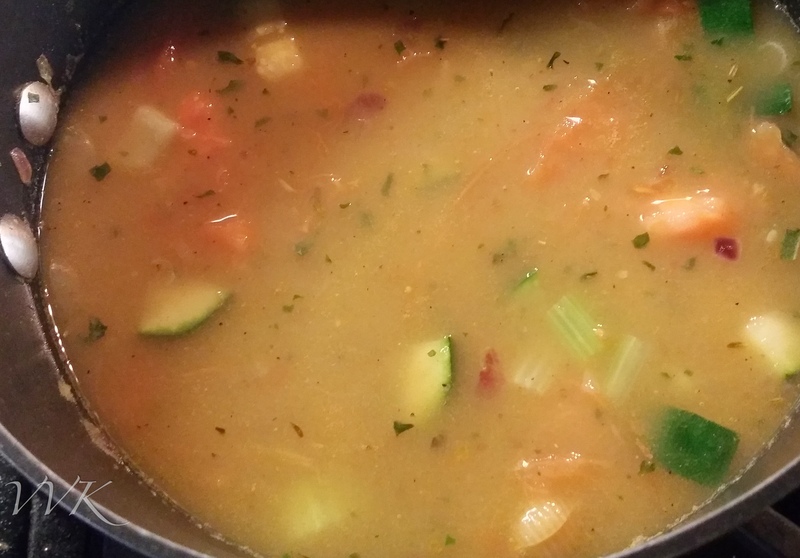 I told about this guest post and she instantly accepted, gave me three options and being a Minestrone soup fan I opted for this recipe. When Vidya asked me for guest post, I was really elated and humbled and when the theme was “Toddler food” I couldn’t say no for sure. Also when Vidya asks, how can this Vidhya say No? 🙂 Vidya was my first virtual friend from the food blogging community. What do I say about her and her blog? 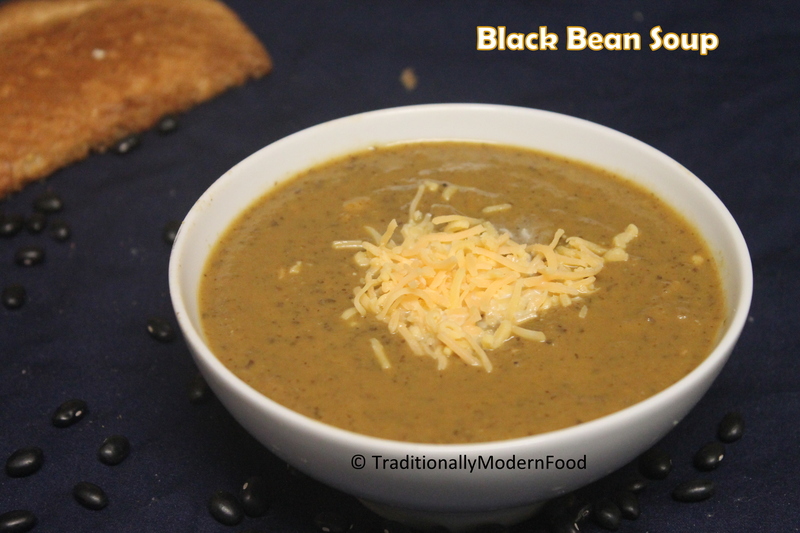 The blog name says it all – Traditionally Modern Food. I love all her recipes and especially the baked versions of thattai, vadai and other delicacies. Its in my todo list and will be trying them soon. I got a chance to meet her also. A fun person to be with and the other thing that I like about her is she readily shares her tips that she follows for posting and stuff. Now tell me who will do that?? I am glad to find a friend for life. Wishing her good luck for all her future endeavours. 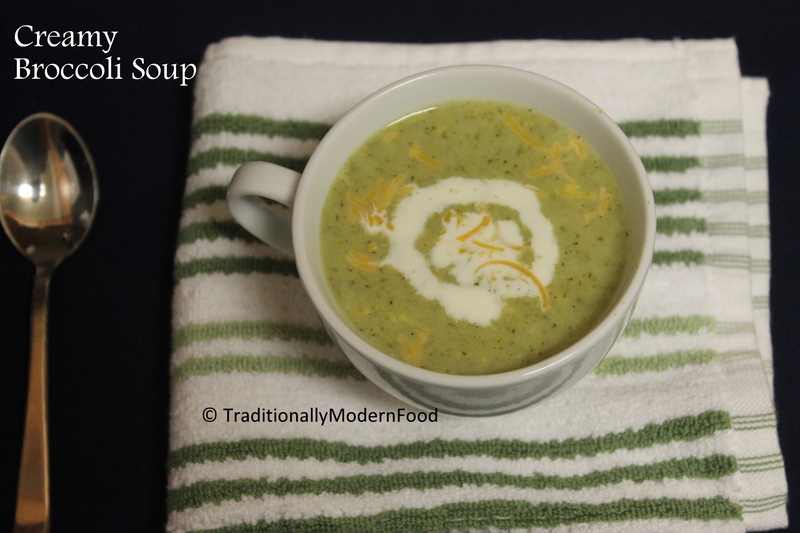 Now coming to the recipe, I have mentioned many times in my blog that my kiddo loves soup. 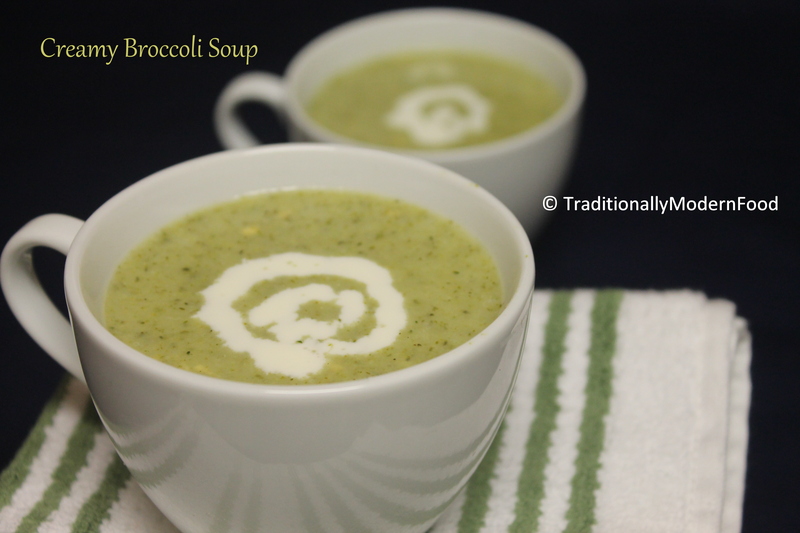 In my opinion, soups are best ways to sneak in the vegetables. 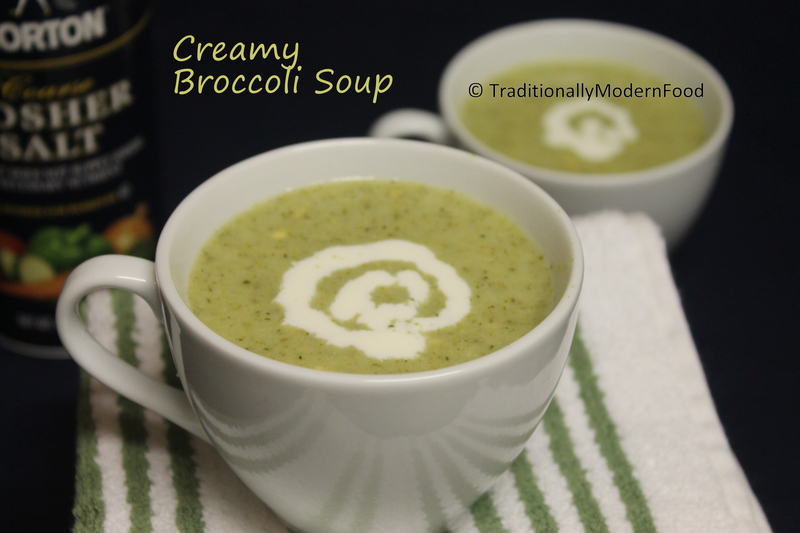 Initially I used to give him pureed soups and then started chunky soups. 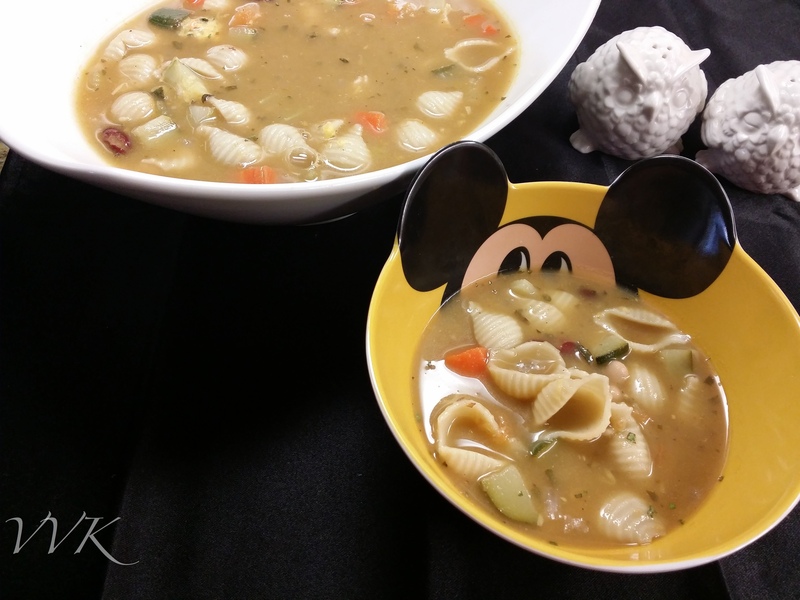 The veggie chunks soaked in the soup broth is easier to chew and a great way to introduce vegetables. 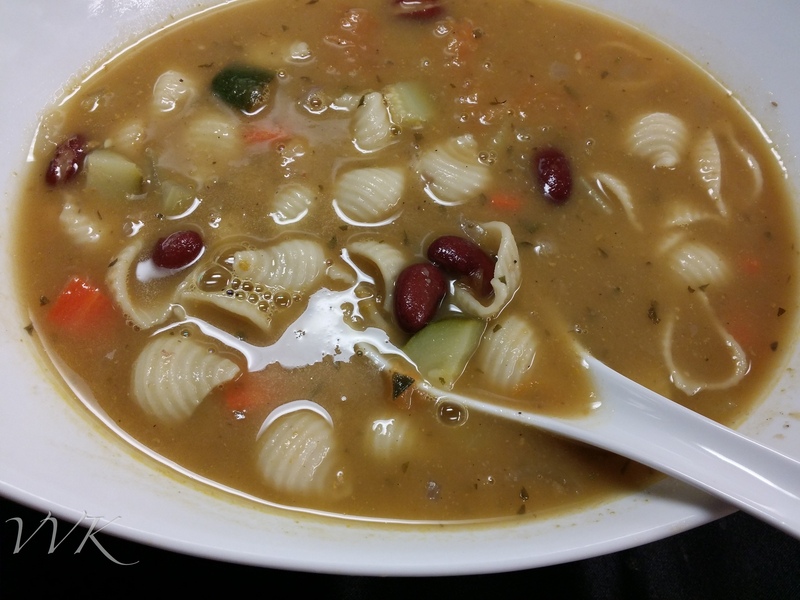 The Minestrone soup is a famous Italian soup and its one of the famous dish in the Olive Garden – Italian chain restaurant in US. 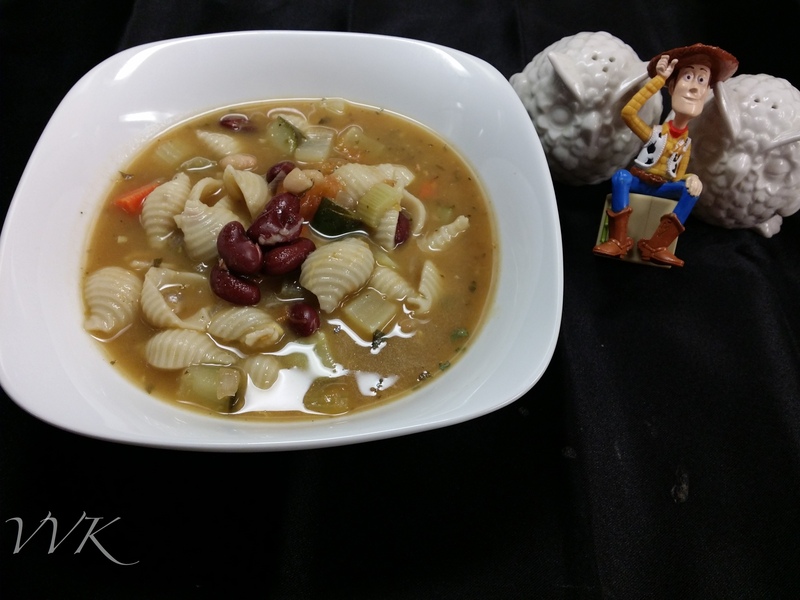 Whenever we go there, we have this soup for sure. Its loaded with veggies, beans and pasta. 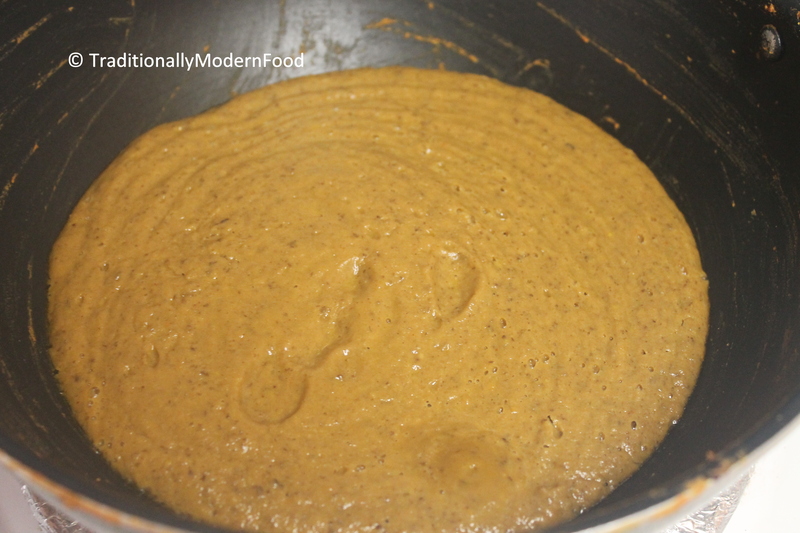 I have tried similar kind with Indian spices but here is the recipe with Italian spices. 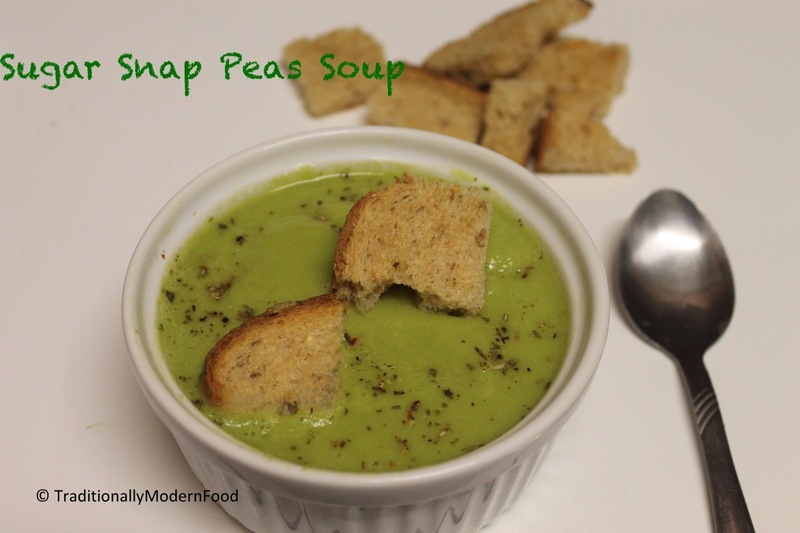 Its a filling soup and you can pack this for lunch too along with some sandwich. 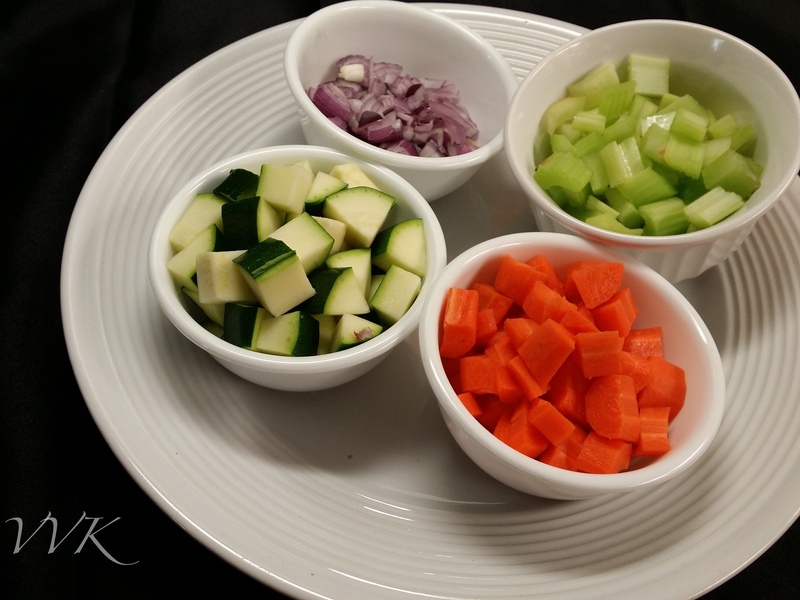 While the tomatoes are getting done, chop the shallots, celery, carrots and zucchini. 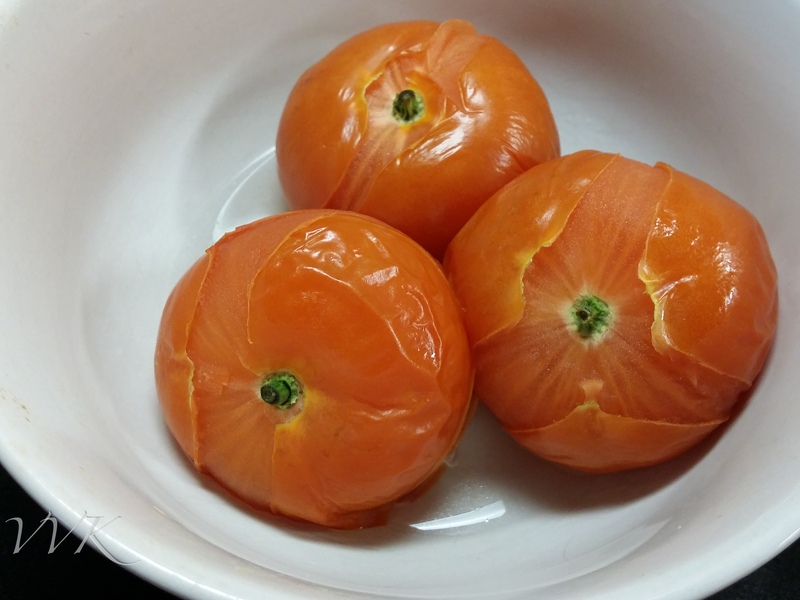 Let the tomatoes cool, peel the skin and chop them into chunks. Once the oil is hot, add the onions and saute till they are translucent. 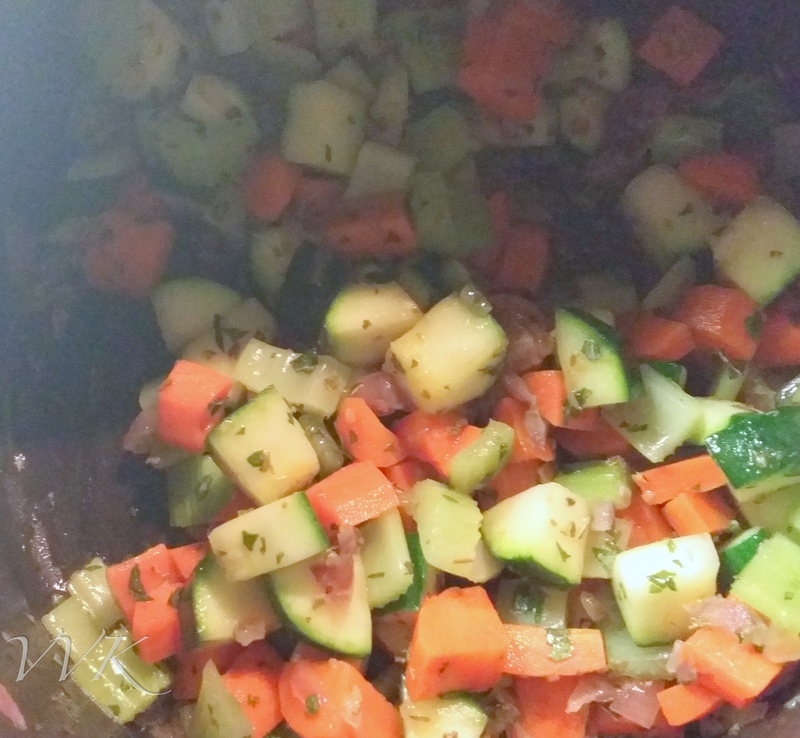 Now add the chopped veggies, oregano, basil and salt and Mix well. Let it cook for up to 3-4 minutes. Now add the tomato chunks and mix well. Add the pasta and vegetable broth. Let the pasta cook in the vegetable broth for 8-10 minutes till they are all done. Finally add the beans and crushed pepper and let it cook for another 3 minutes. Thats it. Yummy soup is ready. 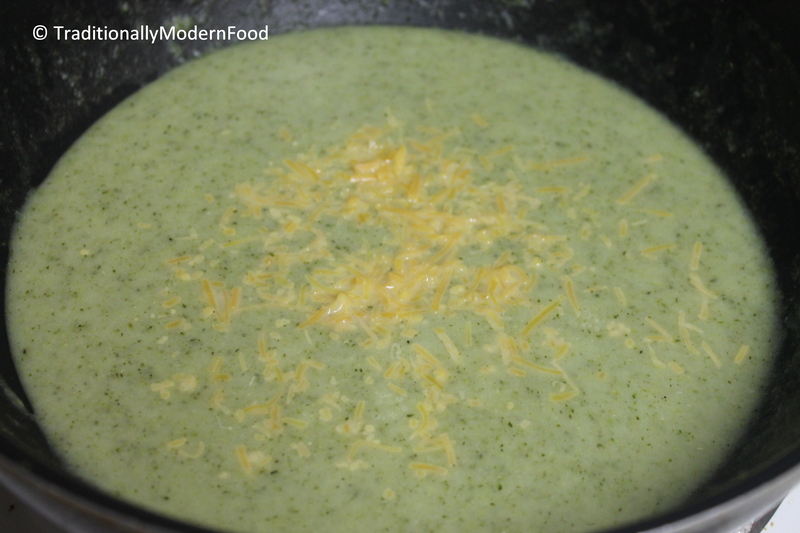 Serve hot with shaved/grated cheese and bread. 1) You can use regular onion instead of shallots. The traditional recipe doesn’t call for shallots though. 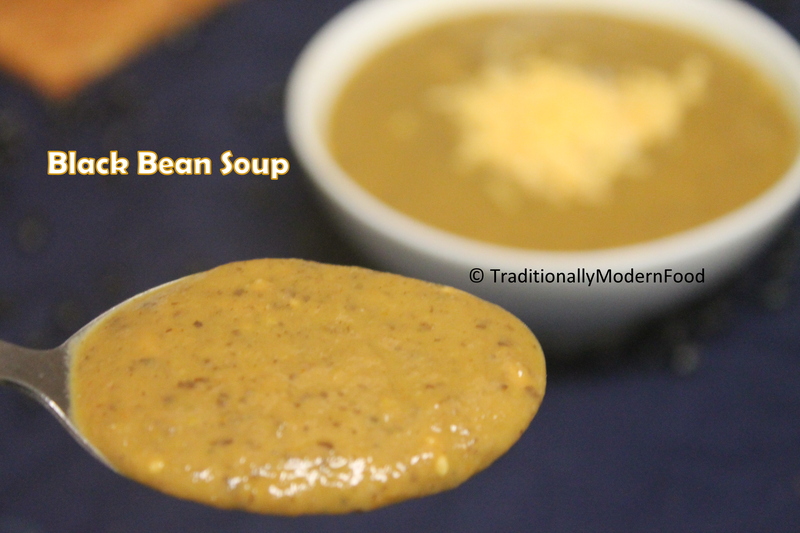 2) If you notice I went with store bought beans and broth. You can make them from scratch too. 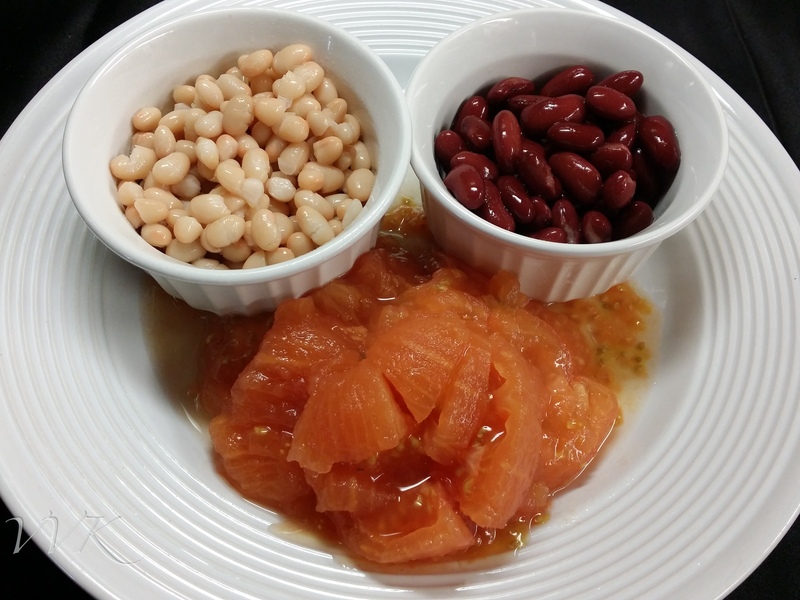 Soak a handful of beans and pressure cook it by adding 1/4 tsp of salt. 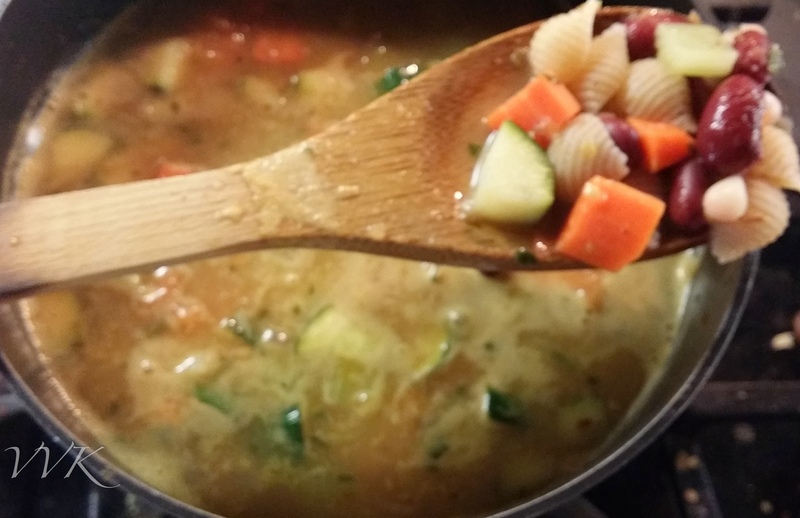 Similarly whenever I do kootu, I save the boiled veggie water and use it as broth. But if I don’t have it in hand I go for store bought. 3) You can also use canned tomatoes and that gives you the red color to the soup. It took me a while (more than that;-)) to send her the recipe. With my LO running around my legs its difficult to capture pictures and draft. The moment I take the camera he comes behind me:-) Luckily my friends understand my position and do not mind the delay. In Genghis grill, I had sugar snap peas for the first time. Genghis grill is a Mongolian Stir fry restaurant. 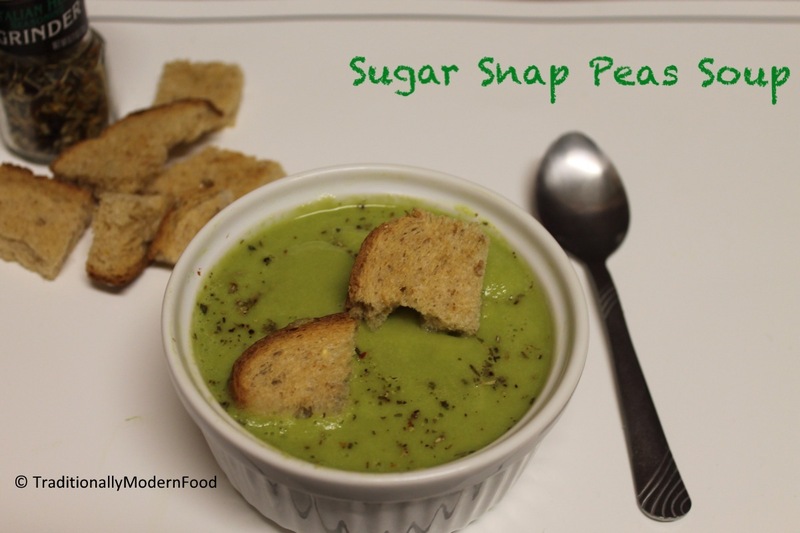 I liked the flavor of Sugar snap peas, it was a bit sweeter than the regular peas. 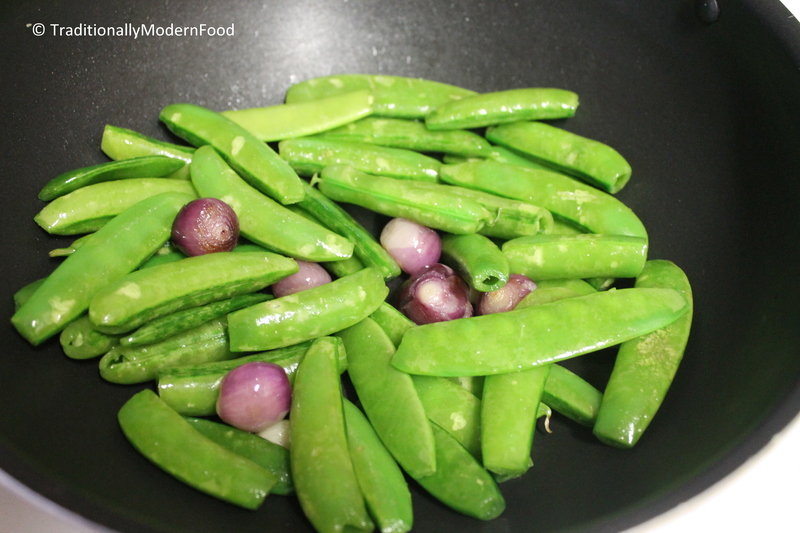 I bought some Sugar snap peas with the intention of doing Stir fry. 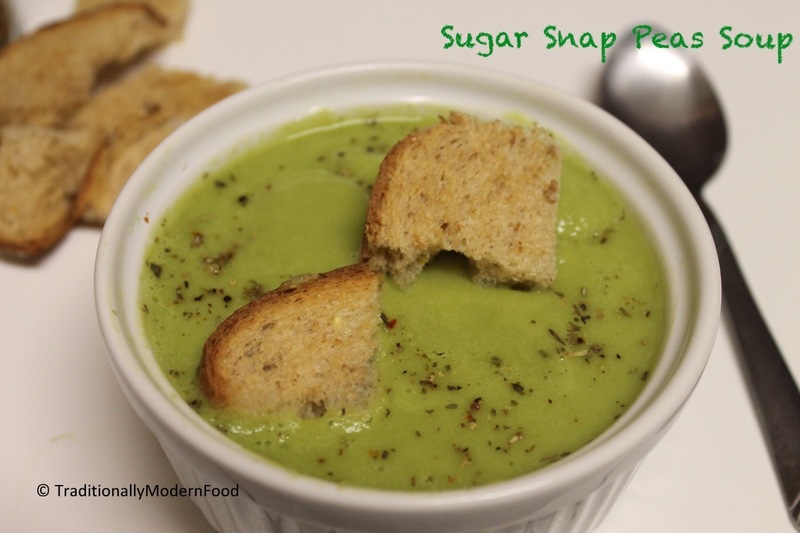 But I got inspired by lot of green soup recipes and wanted to try a soup with Sugar snap peas. 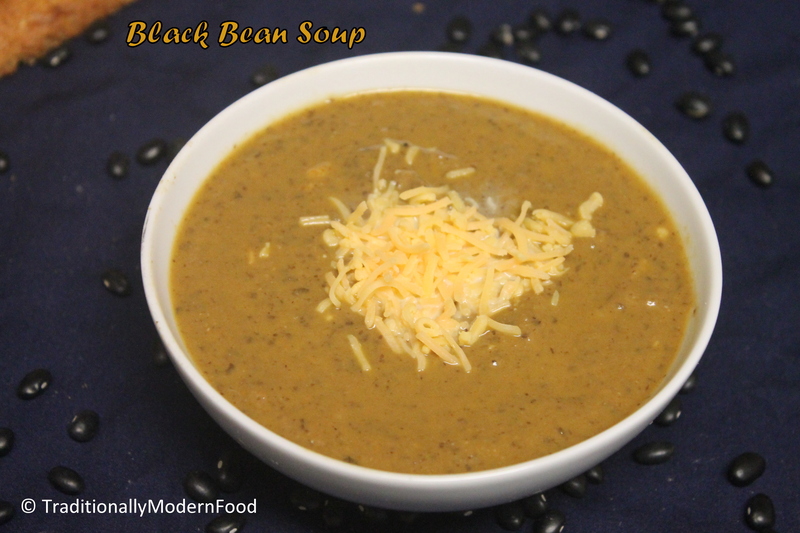 It turned out to be healthy and flavorful! I used avocado for the creaminess, thereby eliminating the need to use corn flour or other thickening agents. 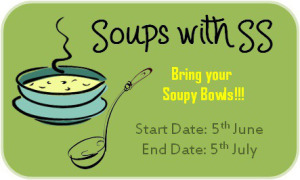 Taking this Soup to the “Soups with SS” hosted by two lovely ladies, Shruti @Cooking with SJ and Sonal @ Simply Vegetarian 777. Sending this recipe to First virtual Vegan linky potluck.